Preparation time: 15 minutes. Cooking time: 1–2 minutes. Place half of black beans and all of salsa in a blender or food processor and process until smooth. Warm tortillas if desired (they fold easier if slightly warm). Lay tortillas flat and spread each with the black bean spread. Top with rice, remaining black beans, corn, and cheese. 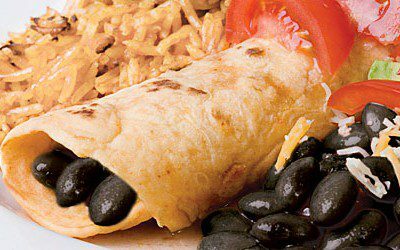 Carefully fold in top and bottom of tortilla then roll up to make a wrap. (Wraps can be made ahead and stored in an airtight container.) Microwave for 1–1 1/2 minutes on high setting, or until heated through, before serving. For variation, add thawed, frozen, fully cooked diced chicken breast (such as Tyson) or strips of leftover, lean pork. Exchanges per serving: 2 starch, 1/2 reduced-fat milk. Carbohydrate choices: 2 1/2.